Located at 3440 W 111th street in Mount Greenwood, Chicago, IL Phone: 773-536-9875 Living with chronic pain is difficult and negatively impacts your ability to go about your daily routine. Our physical therapy department at Joyce Family Medical uses every tool available to ensure that you move freely without any pain. Our goal is to get you moving through life, doing the things you love without pain. Our fantastic group of licensed professionals are great resources for this practice, and want what is best for you! Physical Therapy helps you recover from injuries and medical conditions. At Joyce Family Medical we implement customized treatment plans, and a variety of treatment techniques, to help you accomplish specific goals such as reducing pain, an increase in movement, and achieving optimal health. If you are having trouble standing, walking, or moving no matter your age, physical therapy can help. Stretching and strengthening exercises help restore your ability to move. 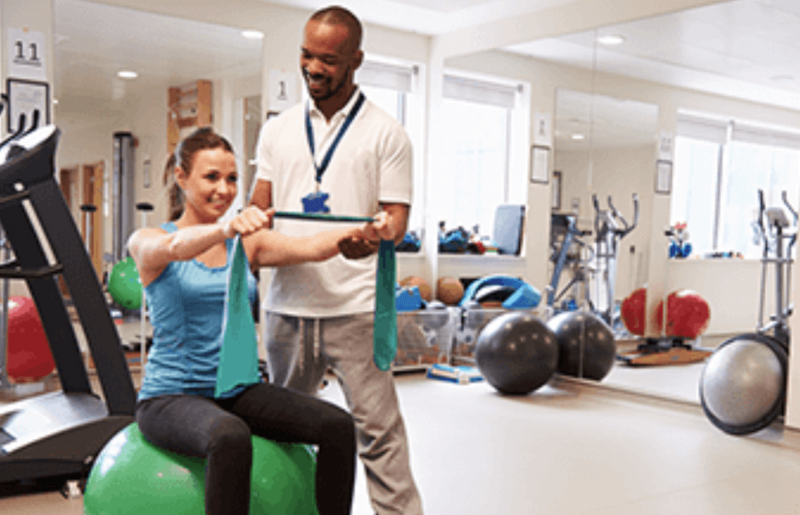 Our licensed physical therapists will incorporate those important exercises and techniques into your therapy to alleviate pain and expand muscle mobility. Physical Therapy restores functionality for certain injuries, or medical conditions, without requiring surgical intervention. Conservative care can lead to decreased pain and improved overall function. Our team successfully treats conditions such as rotator cuff tear, and degenerative disk disease with our physical therapy techniques. Therapeutic treatments can prevent the need for opioid pain relief medications. Opioids and prescription drugs have many side effects and their use can lead to depression, addiction and withdrawal. Physical therapy will help control long-term pain without having to worry about taking medication. Prehab is physical therapy you receive before a surgical procedure. This approach will reduce your recovery time and help improve outcomes. Pregnancy along with delivery takes a definite toll on a mother’s body. Pregnant women go through a physically demanding ordeal that makes them an ideal candidate for physical therapy. Early intervention will help eliminate the aches and pains that might take months or even a year to surface. CALL OUR OFFICE TO MAKE YOUR PHYSICAL THERAPY APPOINTMENT NOW! At Joyce Medical Group, our skilled physical therapists pride themselves in providing quality ONE on ONE care throughout your treatment. Our therapists focus heavily on manual therapy and hands on techniques. Unlike other physical therapy offices, where you are treated like a number, our relationships with our patients is our number one priority. We are completely invested in every patient that walks through our door and we want you to reach your maximum potential. You need to get back to doing the things you love and we want to help. Joyce Medical Group is a family friendly neighborhood office. If you can’t make an appointment because you have your kids then bring them with. It’s not uncommon for our staff to walk a fussy baby while mom or dad is getting a treatment. We want you better and we will do whatever we can to help. Our goal is to generally improve your quality of life and give you more confidence so you continue to enjoy the things you love. If you do not have a doctor, or it is very difficult to get in to see you doctor, we can take care of your insurance referral right here in the office. We have a Nurse Practitioner and Chiropractor in the office. They are easily accessible and, depending on your insurance, can write your physical therapy prescription. For those of you who don’t have great coverage, or your coverage is maxed out, we have a great option. You can schedule a wellness visit. We offer cash prices for 1⁄2 hour, and hour long, sessions. This is a great option for people who might want a “tune up” and can’t use their insurance. You can also bundle a monthly visit with our chiropractor or massage therapist to get the most bang for your buck!! If you have any questions please call and one of our Therapists will be happy to address all of your concerns.